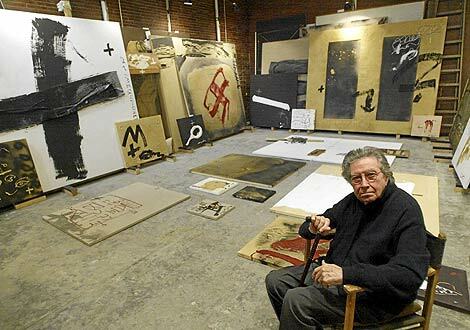 As Antoni Tàpies follows Cy Twombly, so another hero leaves the stage, another studio falls silent: the Spanish painter-philosopher whose austere presence I often felt in the background during those early years of painting when role models seemed so essential. In photographs, on screen, I would see his monkish presence move in and out of the heavy shadows of his cell-like interiors, at one with the spare shapes of the walls, doors, windows and beds of his Catalan homes, mostly absorbed in reading, thinking and image making. The substance of his work, its sometimes overbearing physicality, with those heavily scored surfaces like torn flesh or pitted walls, seemed at odds with their mysterious emptiness, with the impenetrable content at the core of their earthy matter. There existed a palpable tension between absence and presence in his pictures; only the livid crosses, the cryptic letters and crude footprints, the licks of Spanish black, seemed to offer some kind of key. If he was driven, perhaps in common with Anselm Kiefer today, to give some palpable and suggestive shape (in paint, varnish and marble dust) to what is hidden or invisible, he was aware that the desire to scratch and tear at the fabric of the phenomenal world would only reveal further mysteries. Art was a tool of introspection, a way to explore ‘the cloud of unknowing’; it was, as he said, ‘only a door that leads, in turn, to a further door’. Until, that is, one reaches the final threshold, beyond which no image returns.